One day we'll all live in these small houses, was one response to the Inhabitat "5 tiniest prefabs" article. Well, in Viet Nam, people are already living in such cramp conditions and making do with it. The shop house above is really just one long corridor. During my trip there, I saw plenty of such houses. A property tax based on road frontage was one reason why people chose to build long narrow buildings. 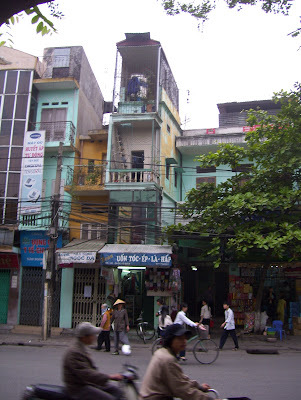 Space is scarce in Hanoi; according to the Ministry of Construction, 30% of people in Hanoi live in very crowded and very small houses with living space per capita less than 3 square meters per capita (1). Google Earth the city and you will not see many signs of planned urban development. During the war and up to 1975, private enterprise in housing was not allowed. People self-financed ad-hoc extensions to existing houses. It wasn’t until the mid 80’s that the housing industry got kick-started. Along the streets you can see tiny bookshops, cyber-cafes and other kinds of businesses lining their wares along small shop fronts, alleys and stairways - anywhere they can fit in. People sit themselves on little stools around toddler-tables to enjoy food sold by the hawkers. 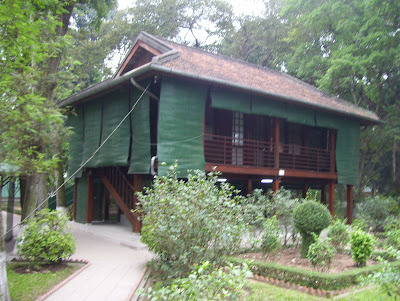 Even uncle Ho (as Ho Chin Min is still fondly called), lived in a very modest house on stilts behind what is now the now Presidential Palace.